In a visit to a historically black university in the Mississippi Delta, Jerome Powell said that many rural areas have not benefited from the national prosperity. He said those areas need special support. Fed Chairman Jerome Powell will hold a news conference at 2:30 p.m. ET today. Watch his remarks here. The Federal Reserve is set Wednesday to leave its key short-term interest rate alone and to signal that it will remain cautious this year about raising rates further. Threats from volatile stock markets, trade tensions and uncertain global growth made the future path of interest rate hikes "less clear," Federal Reserve officials said during their December meeting. Powell's comments, made during a panel discussion in Atlanta, were immediately cheered by financial markets, which were already rallying on the basis of a strong unemployment report that showed 312,000 jobs were created in December. The quarter-point hike, to a range of 2.25 percent to 2.5 percent, lifted the Fed's benchmark rate to its highest point since 2008. The increase will mean higher borrowing costs for many consumers and businesses. 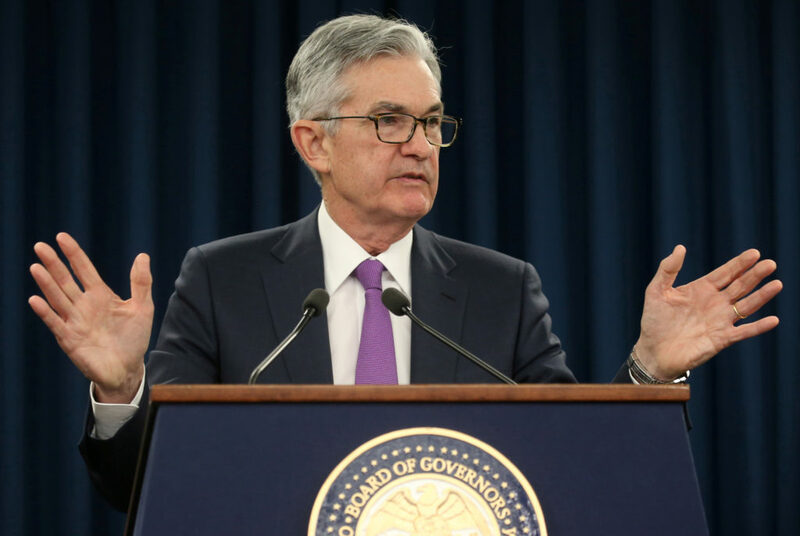 Federal Reserve Chairman Jerome Powell cast a bright picture of the U.S. economy Wednesday and appeared to suggest that the Fed might consider a pause in its interest rate hikes next year to assess the impact of its credit tightening.